Michael Dunlop on his way to victory on the Team Classic Suzuki XR69 in the Superbike race at the Classic TT. UPDATE: Dean Harrison, James Hillier, Jamie Coward and Horst Saiger - who finished second, third fifth and sixth respectively - have been disqualified from the results due to 'technical infringements'. Michael Rutter is promoted to second place in the revised results, with William Dunlop moving up to third. Conor Cummins, Gary Johnson and Danny Webb are the top six. 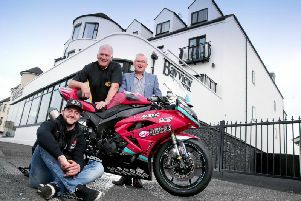 Ballymoney’s Michael Dunlop celebrated a big Bank Holiday Monday double at the Classic TT on the Isle of Man with a record-breaking victory in the showpiece Motorsport Merchandise Superbike race. Dunlop had earlier won the Okells Junior race on the Black Eagle MV Agusta and followed up in the main race of the day on Steve Wheatman’s Team Classic Suzuki XR69, repeating his victory on the machine from 2015. It was the 27-year-old’s third win in the class and his fourth overall at the Classic TT after his maiden success in the Junior race on Monday morning. Dunlop shattered Bruce Anstey’s lap record on his second lap to establish a new mark of 126.808mph and underlined his dominance with a new race record, improving on his previous best for the four-lap race by almost 40 seconds. The Ulster rider led all the way to win from England’s Dean Harrison (Silicone Engineering Kawasaki) by 19.2 seconds, with James Hillier on the Greenall Kawasaki ZXR750 rounding out the podium places. “The boys put so much effort into these bikes and there’s a lot of money thrown at them, so it’s nice to be able to pay Steve back with a win today,” Dunlop said. By Ramsey on lap one, Dunlop’s advantage was six seconds over Harrison, with Hillier a further two seconds back in third and Dan Kneen holding fourth, only 2.5 seconds behind Hillier. Dunlop’s opening lap of 125.872mph saw him increase his lead to 7.3 seconds, while Harrison posted a lap of 125.026mph to become the fastest ever rider on a 750cc machine around the Mountain Course, taking over the mantle from Jim Moodie, who held the previous record from 1999, when he lapped at 124.45mph on a Honda RC45. Manx rider Kneen retired from fourth place at Glen Darragh on lap two, promoting Ivan Lintin into fourth on the Devitt RC Express Kawasaki. Steve Mercer was also an early retirement on the Mistral Kawasaki on lap one at Sulby. Dunlop extended his cushion to 18.3 seconds on the second lap, but Harrison slashed the deficit after opting not to fit a new rear tyre during the pit stop, with Dunlop’s stop taking longer as his crew fitted some fresh rubber on the rear of the big Suzuki. At Glen Helen on lap three, his lead was now only two seconds over Harrison, with Hillier still third and Michael Rutter now improving to fourth on Roger Winfield’s Harris Yamaha. However, the 13-time TT winner soon put the hammer down and at Ramsey he had some breathing space with a lead of eight seconds, which he had increased to 13.1 seconds at the end of the lap. He pulled further clear on the fourth and last lap, with 16 seconds the difference at Glen Helen over Bradford rider Harrison, while Hillier was safe in third, 16 seconds further in arrears. Rutter and Bruce Anstey on the Padgetts Yamaha YZR500 were the top five. Dunlop maintained a strong pace over the final lap, ending with a speed of 125.348mph to seal his second victory of the day after his earlier win in the Okells Junior race on the Black Eagle MV Agusta. Harrison consolidated second position ahead of Hillier, while Rutter held onto fourth ahead of Jamie Coward and Austrian Horst Saiger, who completed the top six. Kiwi Anstey suffered misfortune after stopping at Glentramman on his final lap on the Yamaha GP machine, while Ivan Lintin retired at Signpost Corner. William Dunlop (Kawasaki ZXR750), Conor Cummins on the Padgetts Yamaha OW01, Gary Johnson (Team York Suzuki) and Danny Webb (Team Classic Suzuki XR69) finalised the top ten.